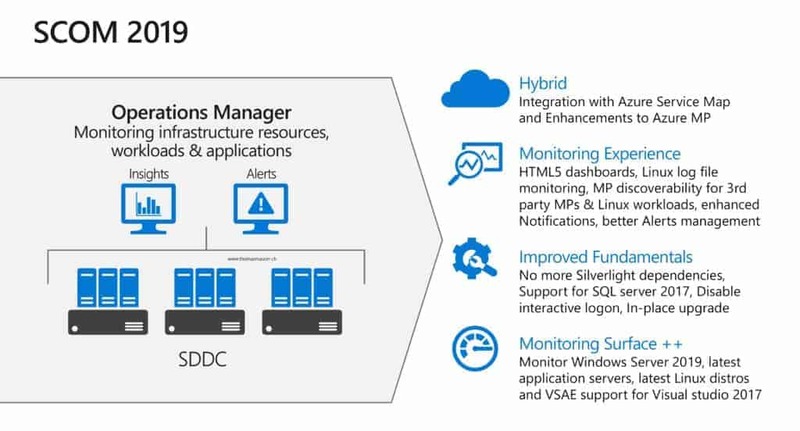 System Center Virtual Machine Manager 2019 comes with a couple of enhancements. 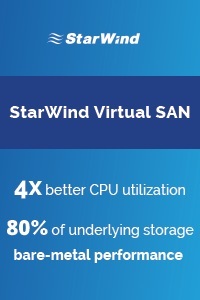 Storage Optimization – If you were using VMM before, you might be familiar with a feature called Dynamic Optimization. Dynamic Optimization checka the load on cluster hosts based on CPU, IOPS and Memory, and moves VMs to another host. New in VMM 2019, VMM also optimizes usage of CSV. If a CSV disk gets full, VMM can automatically migrate VMs including the disk to another volume. Storage Health – VMM can also detect issues with Storage Spaces Direct clusters and detect storage and hardware failures. 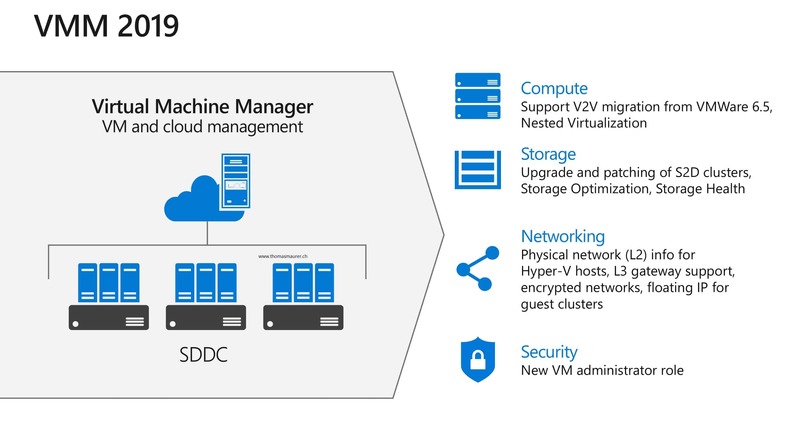 Upgrading Storage Spaces Direct Clusters – VMM 2019 can now automatically upgrade S2D clusters based on Windows Server 2016 to Windows Server 2019. VM Admin Role – Virtual Machine Manager has a couple of pre-defined roles like Fabric Admin or Tenant Admin. There is a new role called VM Admin Role, which gives you something between the fabric admin and the tenant admin. The VM Admin Role allows access to manage the VMs and have read-only access to the fabric. Host Layer 2 networking information and L3 Gateway support – VMM 2019 gives you more information about the L2 host networking information using Link Layer Discovery Protocol and allows you to manage L3 Forwarding Gateways. Virtual Network Encryption support – SDN in Windows Server 2019 now supports Virtual Network Encryption, VMM allows you to manage and configure this. 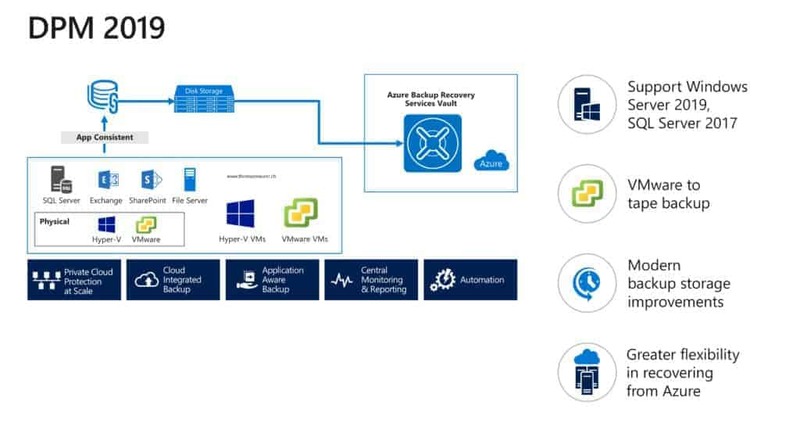 Microsoft is also working on a Hybrid Cloud Integration using Microsoft Azure, for services like Azure Update Management, ASR, Azure Backup, Automation, Azure Migrate and more. This is kind of similar to the integration in Windows Admin Center. System Center Operations Manager also gets a couple of great updates. 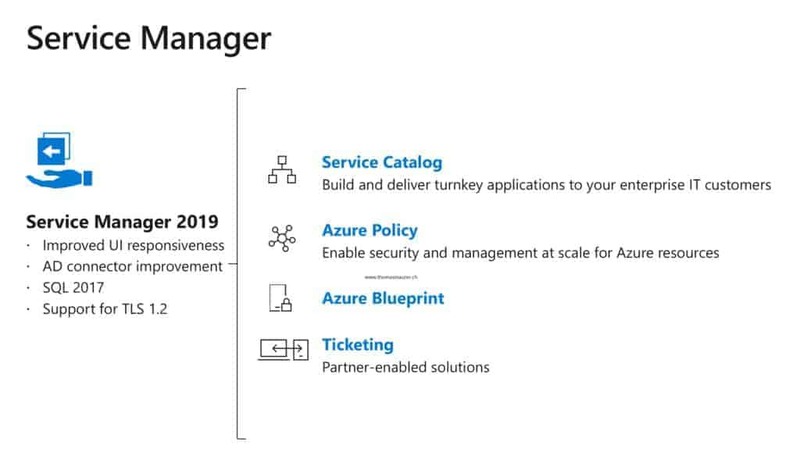 Hybrid – SCOM 2019 gets integration with Azure Service Map and improved Azure Management Pack. 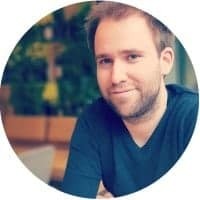 Improved HTML5 dashboards – The new SCOM 2019 web console has no more dependencies on Silverlight and are fully HTML5, more browser support, extensibility for third parties, faster resolutions with better views, inline actions and more operator-friendly meaning remediate issues from the web console. Enhanced notifications and alert management – Enhanced criteria builder, rich HTML email notifications for customization of notification emails. Like VMM and SCOM, also System Center Data Protection Manager gets a couple of updates. 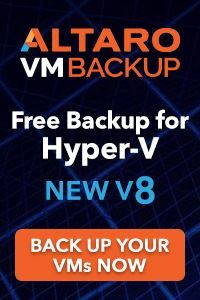 VMware to tape Backup – DPM will get support for backing up VMware VMs to tapes for long-term retention. Modern Backup Storage – There are a couple of improvements how DPM handles the Modern Backup Storage using ReFS. 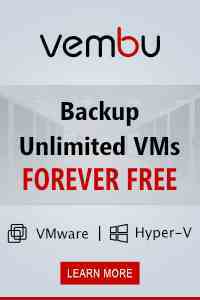 These should enhance the reliability and performance of backup storage. More flexibility to recovering from Azure – Even if you lose your local DPM database, you can now still restore workloads from Azure. Enhanced Reporting and Monitoring – Integration of DPM servers connected to Azure Backup, Azure Log Analytics or PowerBI. System Center Orchestrator gets some minor but essential updates. Like SCOM, also System Center Service Manager got some minor, but very welcome updates. System Center 2019 will be a LTSC release and is planned to be released in Q1 2019. Until then we might see some other improvements and some more details about the release. We just announced that System Center 2019 will be generally available in March 2019. With that announcement, Vithalprasad Gaitonde Principal PM Manager System Center, also announced that from this moment we will also have some changes to the release cadence of System Center. Update: System Center 2019 is now generally available! What about Azure Pack. Is it still supported in 2019 ? Like 2016..
do you have any more details on this new feature in SCOM “Enhanced certificate validation for web application monitoring” ? Does that allow us to monitor the expiry date of certificates ? We require something like that and have not yet found a suitable solution for it. Any News about the Release Date from SCVMM 2019? Hi Steve, And today we announced that Microsoft System Center will be generally available in March 2019! Will DPM end user recovery ever return? 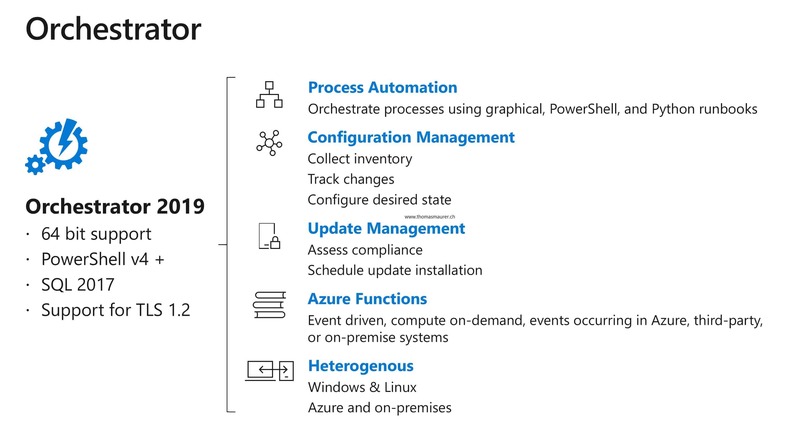 Is there any training or documentation for SCSM 2019 available, or anticipated? Thank you very much for sharing the valuable information. We would like to start using SCCM 2019 on Windows operating system server 2016 with SQL 2017. I would be thankful if you can suggest me with Pre and post implementation guide.